As if shopping on Black Friday isn't stressful enough. This year, shoppers could face even longer check-out lines thanks to the recent credit card upgrade. Banks have been sending out new chip-enabled credit cards that offer more security, but change the payment process -- and can make it longer. The swipe is out. Consumers must now insert their cards into terminals to complete a transaction. And old habits are hard to break. "This holiday season there is certainly going to be more confusion at the check-out," said Rob Cameron, chief product and marketing officer at credit card processing company Moneris. Confusion can extend the check-out time, which leads to longer lines. 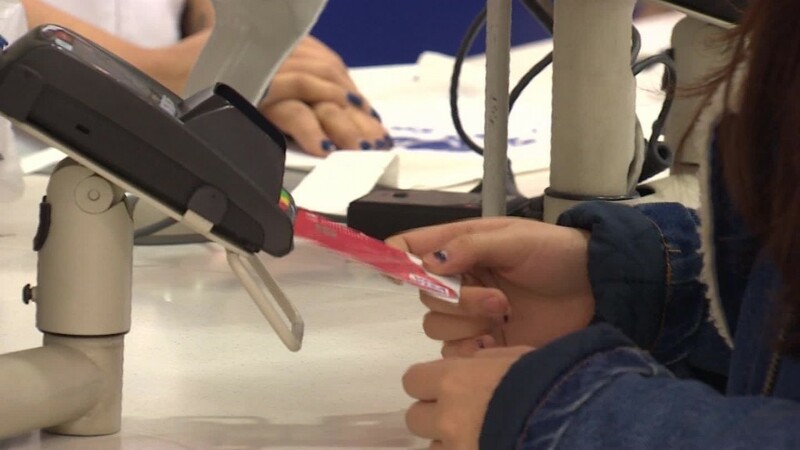 "This is certainly not the ideal time of year to do this," said J. Craig Shearman, a spokesperson for the National Retail Federation, on the transition to the new cards. Related: Just how safe is your new credit card? And here's what can make the situation even more confusing for customers: Not all cards have been updated -- some still need to be swiped. Plus, many retailers haven't upgraded their systems to accept the new cards. According to Cameron, roughly one in four merchants will accept chip cards this holiday season. And even if a payment terminal has a place to insert a card, that doesn't always mean the merchant is capable of accepting chip cards. "Everyone is in learning mode, even the merchants," said Jamie Topolski, director of alternative payment strategies at Fiserv. The new cards, which banks began rolling out earlier this year, have a microprocessor that holds a user's payment data and creates a unique code for each sale. On old credit cards, that payment data is held on the magnetic stripe, which is easy to steal and replicate. Inserting the new cards into the terminal takes a bit longer (one to 10 seconds, depending on who you ask). "Seconds can add up, but consumers will adapt," said Shearman. Wal-Mart (WMT) has been accepting chip-enabled cards since last November, and trained its sales associated to be proactive and help customers through the change. "The first time [customers] use them, there is a learning curve, but we gave cashiers instructions and we've cut down on the transaction time," said Randy Hargrove, a company spokesperson. But the holiday shopping surge often means new seasonal workers, who could also slow the check-out process. "Many retail stores bring on extra staff and don't have the time and bandwidth for thorough training," said Randy Vanderhoof, executive director of the Smart Card Alliance. The good news is big-box retailers, which tend to dominate Black Friday, are more likely to have upgraded systems, he added.